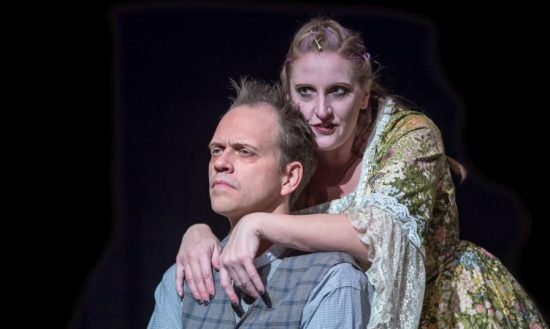 Hans Dettmar and Elizabeth Hester lead the way in Kensington Arts Theatre’s dark and disturbing production of “Sweeney Todd,” now playing at Kensington Town Hall. Photo by McLaughlin Photography. “He shaved the faces of gentlemen, who never thereafter were heard of again. He trod a path that few had trod, did Sweeney Todd, the Demon Barber of Fleet Street.” This sinister tale of revenge and murder unfolds onstage at Kensington Town Hall through November 17th, 2018. This dark tale was inspired by the “penny dreadfuls” of Victorian times. These were cheap, paperback books that would detail lurid details of violent crimes. Sweeney Todd had been a play first, but Stephen Sondheim expanded this macabre tale of the wronged barber who seeks revenge on the people who wronged him, but also on the world that allowed this wrong to exist in it. The story opens with altruistic sailor, Anthony Hope (Brian Dauglash), returning to his home of London. But his warm reverie is spoiled by his companion, Sweeney Todd (Hans Dettmar.) While Todd expresses disdain for everything around him, he has a sensitive spot for the sailor, who saved his life at sea by pulling him from the water, but never asking Todd how he got there in the first place. Both men are harangued by a beggar woman (Brittney Bartlett) who begs for alms and then offers some saucy favors in return. The good-hearted Anthony offers her a shilling, but Todd pushes her away roughly. The two men then go their separate ways; Todd heads back to his old neighborhood and wanders into Mrs. Lovett’s (Elizabeth Hester) pie shop. She recognizes Todd as Benjamin Barker, the barber who used to rent the shop upstairs, and shares with him the sad fates of his wife and daughter after he was sent away for life on a trumped up charge. …a strong and dynamic representation of a heavily produced show that actually had something new and fresh to say. The man who sent him away, Judge Turpin (Jim Adams) wanted Barker’s beautiful wife for himself, so he sent the smarmy Beadle Bamford (Christopher Gillespie) to bring her to his place. As a result of the trauma she experienced at the hands of the judge, Mrs. Lovett says she poisoned herself, and now his beautiful daughter Joanna (Simone Brown) is a ward of the evil judge. In a rageful despair, Sweeney decides to take revenge upon the people who caused his life to be destroyed and took his family from him, and Mrs. Lovett is all too willing to help. The first test of their resolve is an Italian barber named Pirelli (Brittney Barlett), whose poor young assistant Tobias (Emily Lawrence) attracts Mrs. Lovett’s dubious pity. This sets into motion many deaths, but also a disgusting business partnership between Todd and Lovett. Ever since its debut on Broadway in 1979, this show has inspired debate and strong feelings, both positive and negative. It has also been a popular choice for community theatre productions, with there being several productions within the DMV just within the last few months. With so much saturation of this story, if you choose to produce it, you’d better have something new to say. This reviewer is happy to report that KAT did exactly that, with an interesting and fresh take on this darkly complex story. This largely revolves around the choices that were made for the characters of Mrs. Lovett and Sweeney Todd. While many other productions make the character of Sweeney overly menacing and give Lovett the out of “she did it all for love,” this production takes a different perspective. Lovett is shown from the start as being wholly self-interested and shrewdly in control, while this Sweeney comes off as much more tortured, and the violence he exudes is more of an encouragement of his darkest impulses from Lovett than a self-initiated impetus. The actors portray this motivation expertly; Hester and Dettmer obviously did a great deal of scene work and character development to build these unique dynamics and did not rely on previous performances of these characters for inspiration, as many others have done. Dettmer’s incredible voice carried his performance, switching from a wistful, haunted tone when remembering his former happy life, to a gravelly tone full of hate when singing about his desired revenge. Also, even though this show has him doing truly terrible things, Dettmer is still somehow able to retain the audiences’ pity through his anguished performance. He stands out in songs like “My Friends,” and “Epiphany.” Hester is having an enormous amount of fun in this role, clearly relishing both her position as comic relief and villain. Her voice excelled in these intricate and iconic songs, slaying classics like “Worst Pies in London,” and “By the Sea.” As previously said, Hester and Dettmer were even stronger together, with the comedically dark “A Little Priest,” being one of the highlights of the show for this reviewer. Another unique aspect of this show was the choice to cast only 8 actors to portray all of the parts in this production. That meant that all of the other performers (besides Hester and Dettmer) played multiple parts within the show. Dauglash was fantastic as Anthony; this character can be annoying if the actor portraying him is not completely authentic with his eagerness and goodness, and Dauglash’s truly genuine portrayal ensured this was not the case for this production. His gorgeous voice also fits perfectly with the sweet, young, lover’s character. He was charming during his solo number, “Johanna” and deftly provided the lighter side of “There’s No Place Like London” alongside Dettmer’s more cynical version. Also excellent was Emily Lawrence’s Toby. Toby is a challenging character as well since he is another character that represents the more innocent side of this story, but then also must demonstrate a huge character development as he is driven mad by the events of the show. Lawrence’s sweet but strong voice is perfect for this role, and even though they are an adult, Lawrence’s mannerisms and behaviors make it completely believable that they are actually a child. Lawrence stood out in the opening section of “Pirelli’s Miracle Elixir,” as well as a heartwarming performance of “Not While I’m Around.” Bartlett did true double duty as both the mysterious Beggar Woman and a cross-gendered Pirelli. She has a beautiful soprano voice that served her well in both these roles, and was especially captivating as the Beggar Woman, keeping the audience interested in who she really might be throughout the show. Adams and Brown turn in strong performances and voices as the Judge and Joanna, and Gillespie is delightfully foppish and creepy as the smarmy Beadle. As anyone who has seen this show live can tell you, it has a ton of moving parts and is incredibly complex to manage, so director Craig Pettinati, music director Stuart Y. Weich, and Stage Manager Carol Jones should be commended for a cohesive and successful production. The choice to use video to portray flashback sequences was inspired, and a great way to make those scenes as impactful as possible. The full orchestra was an excellent addition, but it was sometimes difficult for the actors to find their cues and keep with the difficult rhythms without being able to see the conductor since the orchestra was backstage. The only other thing that I struggled with was the choice to have Pirelli sing in the soprano register, yet still portray the character as male. It took me out of those scenes a bit and could have been more successful if either the part was sung down the octave or if Pirelli had been revealed to be a woman. The set was interesting, if a bit stripped down, and did a great job with the biggest problem in producing this show – how to get rid of the bodies of Sweeney’s victims (Scenic Design by Jared Johnson.) There was also the choice to make the set come into the audience, which increased both the intensity of some scenes as well as making the audience feel like voyeurs in the dark events of this show. Overall, this was a strong and dynamic representation of a heavily produced show that actually had something new and fresh to say. They have one weekend left of shows; I highly recommend you visit Sweeney’s barber shop before he packs it up for good. Running Time: Approximately 2 hours and 45 minutes with a 15-minute intermission. Advisory: This show has strong adult themes and language and is recommended for audiences 16 and older. There is also heavy use of theatrical smoke throughout the production. “Sweeney Todd: The Demon Barber of Fleet Street” is now playing at Kensington Town Hall through November 17th, 2018. For more information on this show and to buy tickets, please click here.